That said, as Wilson notes, the team isn’t likely to pursue top-of-the-market options like Dallas Keuchel and Patrick Corbin. Rather, a less substantial investment — something along the lines of last winter’s Mike Minor signing (three years, $28MM), perhaps — could be in the cards. Of course, that assumes not only that the Rangers will be able to offer enough money, but also that they’ll be able to woo an appealing hurler to join a roster that likely won’t be expected to contend immediately. Of course, the very same uncertainties also make the Texas club “a pretty attractive destination” for pitchers who are “willing to compete for innings in Spring Training,” as Daniels put it. Even if the Rangers end up making a reasonably splashy acquisition, they’ll surely be looking for other arms to battle it out in camp. After all, there are slim pickings on hand. Beyond Minor, Adrian Sampson, Yohander Mendez, Ariel Jurado and Eddie Butler all possibilities in 2019. Edinson Volquez, too, could be in the mix at some point as he works his way back from Tommy John surgery. Wilson notes that Yovani Gallardo would like to return to Texas as well, while the door also seems open for Martin Perez to come back even if his option is declined (as probably ought to be expected). While it’s true, then, that there are possibilities on hand, that group of hurlers is not exactly overflowing with MLB accomplishment and promise as compared with most staffs around baseball. Neither would the above-suggested reunions clearly move the needle. Given Gallardo’s extraordinary decline and poor results in 2018, for instance, a minor-league deal seems appropriate. It’s also questionable whether Perez is worthy of an MLB pact, though he has youth on his side and has been useful at times in the past. Clearly, then, Daniels is to be taken at his words regarding the clear-cut openings in the rotation. The situation could very well hold appeal to starters who know they’ll need to win jobs on non-guaranteed pacts in Spring Training. The veteran executive notes, too, that the organization is open to being “a little less traditional” in how it structures its staff, perhaps opening the door to some creative options in structuring a staff. 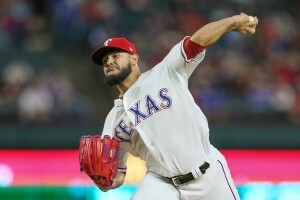 Bold thinking may well be necessary; barring some unexpectedly consequential acquisitions via trade and/or free agency, after all, the expectations will likely not be terribly lofty for the Rangers’ 2019 rotation. As Evan Grant of the Dallas Morning News explores, a rough first half of the season for the Rangers was not without its implications for the future. Unfortunately, for every positive turn (the recent improvements of Rougned Odor, say), there has been a less-encouraging development (Joey Gallo’s fall-off, for instance). Most disappointing of all, perhaps, is the fact that the club likely won’t be able to reap much of a return for its veteran assets at the deadline. As Grant notes, key potential chips like Cole Hamels and Adrian Beltre really aren’t performing as might have been hoped, while many of the team’s pending free agents haven’t really played their way into useful trade assets. MLB.com’s T.R. Sullivan writes that the Texas organization will be doing everything it can to acquire young, upper-level starting pitching at the deadline. Given the less-than-ideal crop of trade pieces, though, that seems like a tall order unless the team is willing to part with controllable talent. Closer Keone Kela is perhaps the team’s best reasonably available trade chip; he’s turning in quality work from the closer’s role and comes with three more seasons of control. Even if he’s made available, though, prying loose top-end young rotation pieces promises to be challenging. Meanwhile, GM Jon Daniels discussed his team’s situation heading out of the All-Star break with Jeff Wilson of the Fort Worth Star-Telegram. There aren’t any truly untouchable players, Daniels said, though unsurprisingly he also noted that certain players “are a lot less likely to be talked about than others.” One name that figures to come up, of course, is Beltre. While Daniels indicated that he’s willing to listen to expressions of interest, he said the team will “have to be motivated to even have the conversation” due to the fact that Beltre’s “value to the organization is above how you typically view it.” This special situation — Daniels said the team views Beltre “as separate than most typical trade conversations,” and the vet has no-trade rights — will be interesting to watch. The future Hall-of-Famer certainly hasn’t been at his best in 2018, and isn’t cheap or youthful, but he will likely be in at least some demand given his lengthy track record and impeccable reputation. Daniels also addressed a few other matters, though of course you’ll need to read the entire piece to get the full scope. He cited a few younger players that have impressed in certain regards, including center fielder Delino DeShields, utilityman Isiah Kiner-Falefa, and first baseman Ronald Guzman. None of those players has really established himself as a future regular, though all seem to have places on the MLB roster moving forward. Daniels also suggested the team will be watching closely in the second half to decide whether to pick up its second-to-last option over southpaw Martin Perez, who’ll either be paid $7.5MM or cut loose with a $1MM parting gift. Perez turned in five middling starts before hitting the DL, but did show much better form in his first outing back just before the All-Star break.